How we came to own alpacas! My Aunt Carolyn received her random “keeping in touch” call from a college friend one day as he was passing by an alpaca farm on his daily commute. 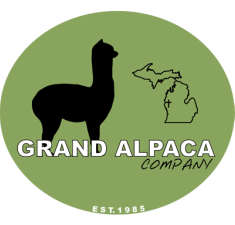 He commented that the alpaca business must be profitable as the owners were making so many improvements to their property. Carolyn was looking close to retiring and as we had always been close she had mentioned this to me as something to do after she retires and moves into my home. She mentioned it to me as she knew I liked to farm and have had my fair share of animals over the years. At this time I was taking college classes focusing on business management for which I had an assignment to create a business plan for a small business, so naturally I decided to do it on alpacas. A short time after this we had gone to the Grand Alpaca Company farm where we met with Tim and Jane. After a few visits and lots of prayer Carolyn made her original purchase of 16 animals. Some time later we had a few more meetings with Tim and Jane where we made arrangements to purchase the rest of Tim and Jane’s herd. In August 2014 we purchased a 40 acre property that has a 100 x 100 pole barn on it. The property was very unique and the way we found out about the property was even better. From our first step on this property we knew it was a blessing from God. The property needed lots of work but we knew that in the long run this was a picturesque location close to Lake Michigan to have our alpaca farm. In the pole barn is our home, so technically we are living with our herd. We can see the animals right from our living room. Since we closed on the property we have been working very hard on clearing the land for pastures and hay fields and every small detail that goes into having a farm. This has been hard at times but so rewarding knowing this is God’s work and he has given us everything we have. In early 2015, Carolyn was able to retire and a month later I was able to do the same in order to give my sole focus to the farm and my family. Many exciting things have happened this year and I am still in shock the year is so close to being over. We have added four new males from Kentucky along with 56 animals from Cameo Rose Alpacas in Ohio to our herd. After several gruesome weeks of laying 140 yards of cement down inside and out of the barn and installing water lines, electrical and so much more we were able to move ALL of our animals to their new home this past November. What a blessing to be able to step outside and do chores after so much time managing several locations. My three children: Chris, Alex and Rachel all help on the farm. Sometimes more than others as there is a lot of fun to keep them busy besides chores. My promise to them is to show them that hard work, determination, and staying focused on God will prove to be a success in all things we walk through in life. I am so thankful to God for the opportunity to work with alpacas, to have a farm in Montague and for all the blessings he has poured out on my family. We strive as a family and farm to be a help to our community by showing God’s love through our work.